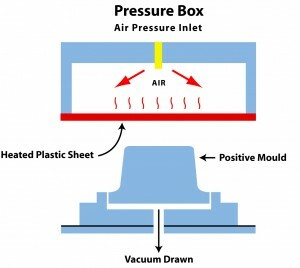 Pressure Forming combines the standard suction drawn vacuum forming process with additional downward pressure from the non-mold side of the heated plastic sheet provided via a Pressure Box. 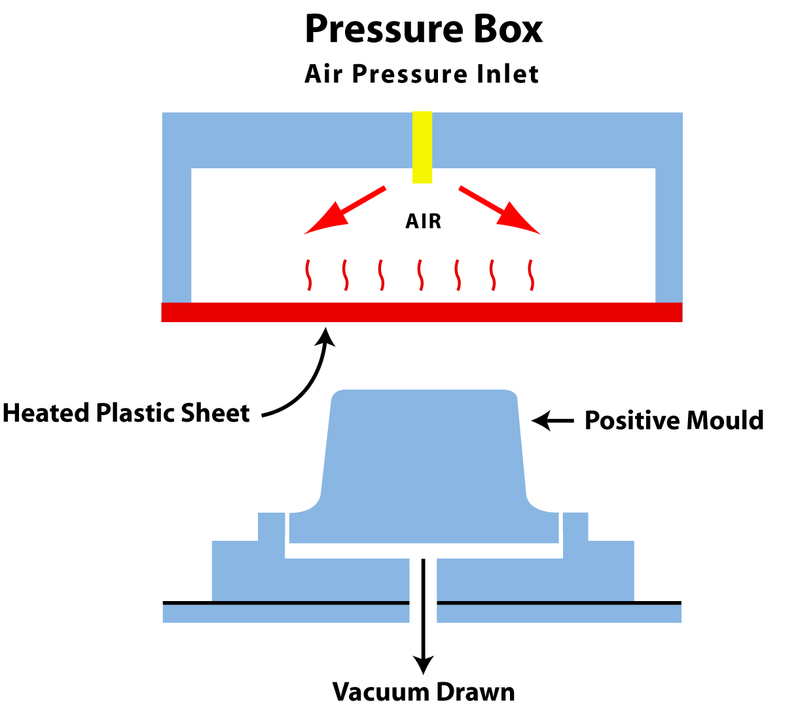 In theory the maximum atmospheric pressure in traditional vacuum forming is 14.7 Pounds Per Square Inch. The added air pressure of up to 60 PSI on the non-mold side can increase the overall thermoforming pressure by as much as 4 times that of conventional Vac Forming. This additional pressure allows for the capability to produce components and parts with finer detail and sharpness. The mold side appearance can closely resemble that of Injection Molded parts but involves much lower tooling and set up costs (20% – 30% less). Pressure Forming is also more cost effective than RIM (Reaction Injection Molding) or Structural Foam Molding and can offer major advantages when requiring textured finishes using female molds. An ideal process for average production volumes on mid to large size components and parts. Pressure Forming can save the day when you want a low cost vacuum formed plastic product with high end appearance, especially on low volume orders. Compared to the more expensive injection molding, pressure forming captures the same sharpness of detail and is proving to be a boon to the plastics industry. Louvered techniques, label & logo recesses along with undercuts for mounting additional components can be molded in. Designers can now incorporate more additional features into products providing an enhanced look and feel. Pressure Forming can increase the visual and tactile desirability of a molded plastic product also offering the extra comfort of a wider profit margin compared to the injection route. 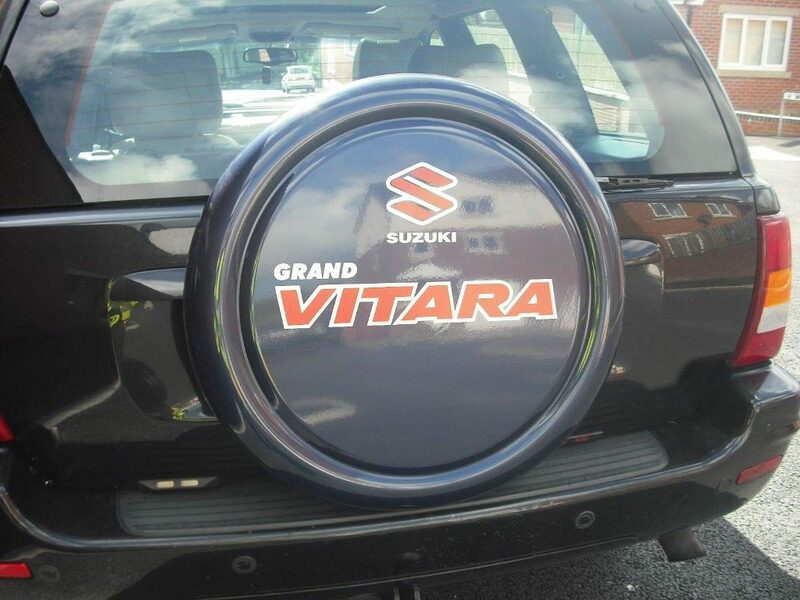 Medical analysis and diagnostic equipment. Industrial areas such as fork lift truck, scientific instruments, automotive, bus and railway carriage interiors, recreational and sports equipment. Contact Euro Extrusions Ltd on 01254 886662 to discuss.